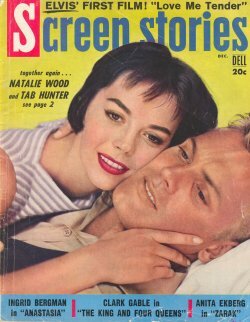 Cover depicts Natalie Eood and Tab Hunter. Cover and spien have chips and tears. Features on Elvis Presley and the movie Love Me Tender, Ingrid Bergman in Anastasia, Clark Gable, Anita Ekberg, and Charlton Heston's Ten Commandments.